No one likes to be locked out or blackballed from the ‘in-crowd’. Well, at the risk of drudging up some old high-school feelings, 3DS gamers of the Super Smash Bros. title have reported being hit with 136-year bans from playing. Apparently it’s down to a bug in Nintendo’s automated anti-griefer technology, which was designed to curb bullying / anti-social activity as well any unsavoury gameplay when playing online. 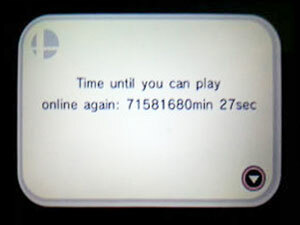 The typical ban times for anti-social behaviour is usually 15 minutes, but fans who’ve been doled the century-long bans have not received anything in the way of acknowledgement from Nintendo. Best thing for players to do to avoid the ban seems to be avoiding the online mode of gameplay all together, which is great obviously as you are not getting full access to the game’s features. And leave the abusive mind-games to Mewto.